Patna is the largest city in the state of Bihar and was earlier famous by the name of Patliputra. It is considered as one among the oldest cities across the world. The city is located on the banks of River ganga and reckoned as Guru Gobind Singh’s birthplace, the last Sikh Guru. This has made it one of the important pilgrimages for Sikhs. When it comes to tourism, you will find various hill stations near Patna (within or above the range of 500 kilometers), religious and historical centers like Vaishali. If you are already making plans to visit this amazing city in Bihar, do not forget to cover these best offbeat places near Patna. Continue Reading. Jamui is among the famous districts in the state of Bihar and is popular for the historical and mythological significance. The place has been in talks since the era of Mahabharata. Tourism in Jamui has been under limelight for the historical buildings and various religious temples all around the district. Some of the most popular tourist attractions in Jamui include Kshatriya Kund Gram, Kali Mandir, Giddheshwar Temple, Kumar Gram, Nagi Dam Wildlife Sanctuary, Jain Mandir, Patneshwar Mandir, Suggi, Simultala hill station, Hazrat Khan Gaji Dargah and some others. Rohtas, is a district in Bihar being part of the Magadha Empire back in the 5th Century BC when the state was under pre-Mauryan rule. The district of Rohtas has a small manifesto of King Ashoka which is an evidence of the Mauryan rule. It was in 1972 after India got independence that Rohtas was declared as an independent district which was earlier a part of Shahbad, another district in Bihar. It is one of the best places in Patna for history buffs and if you are one, it is time you book last minute flights to not miss exploring this wonderful place. Rohtas is considered as one of the best tourist places near Patna, only at a distance of 155 kilometers from the city. It has the ever charming Rohtasgarh Fort, an example of the art and architecture of the Mughal times. Sasaram, is another important place sheltering the giant tomb of Sher Shah Suri and the Shergarh Fort – a piece of art constructed by Hassan Shah Suri. The district also frames some of the religious temples and a masjid apart from these historical monuments and sights. Visit the main tourist attractions like Tarachandi, Chacha Fagulmal Sahib Ji ka Gurudwara, Gupta Dam, Dhruwan Kund, Akbarpur, Deo Markanday, Bhaluni Dam, Rehal, Akhorigola and some others. 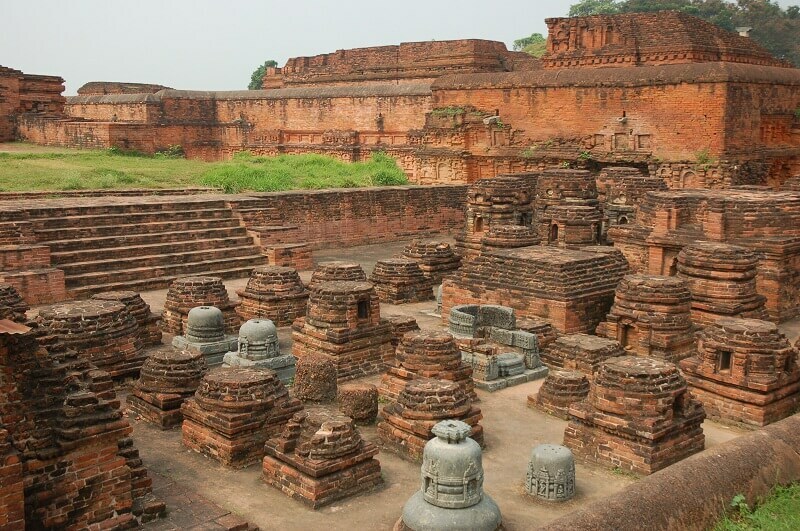 Situated 81 kilometers from the city, Nalanda is one of the most important places to visit near Patna. If you are an avid traveler, you probvably have heard about this place. Nalnda is not just about the university ruins (the famous Nalanda University) but has a lot more to offer when it comes to tourism. You can visit the historical tomb of Bihar Sharif, the pious Malik Ibrahim Baya Dargarh, Nalanda Museum. Drive to Baragaon, a small town situated at a short distance of 2 kilometers from Nalanda. There is a sun temple known for the traditional festival Chhath Puja. If you are in the city for work purpose, that business class flight can also buy you a good trip to Nalanda. Vaishali is an offbeat place near Patna which is eventually getting into the limelight of travel and tourism in Bihar. It is a firm standpoint of culture, religion and archaeology. Some of the main tourist attractions in the region include Kundalpur, Coronation Tank, Ashoka Pillar, Buddha Stupa, Ranchura, Buddhi Mai, Raj Vishal ka Garh, Vaishali Museum and the World Peace Pagoda. The main reason why Vaishali is getting the limelight is its Vaishali Mahotsava celebrated on Lord Mahavira’s birth day. Another fair is held 35 kilometers from the city named Sonepur fair. Some other distinguishable elements that is popularizing Vaishali as a tourist destination near Patna are the Madhubani Paintings, local handicrafts and stone sculptures. Visiotors interested in art and architecture appreciate these artworks and buy some from the traditional village shops. The most common handicrafts include lac bangles and home-made toys. Though not completely offbeat, many people still don’t know about this pilgrimage Gaya. Gaya is the place where Buddha, the founder of Buddhism, attained enlightenment thus making it one of the popular Buddhist destinations in the country. Coming to tourism in Gaya, there are several hills it is known for such s Ramshila, Yoni and Pretishila; Pawapuri and Deo Barabar Caves and some more. The temples and ghats in the area are lined along the banks of the Phalgu River. Do not forget to visit some of the architectural and religious marvels like Gauri Mandir, Jama Masjid, Vishnupad Temple, etc. The cuisine of Gaya is also worth giving a try. Taste the delicious regional food of Bihar litti chokha, pua, sattu ki roti, marua ki roti and pittha. Also try the sweets like Kesaria Peda and tilkut.